The following are the latest results contributed by HM Courts Service, for cases sentenced by West Sussex Magistrates’ Court sitting at Worthing from February 22 to 27, 2019. Samuel Heasman, 24, of Bewley Road, Angmering, was given a community order with Rehabilitation Activity Requirement and must pay £85 victim surcharge after admitting possessing 1.5g of amphetamine, a class B drug, in Rustington on January 12, 2019. 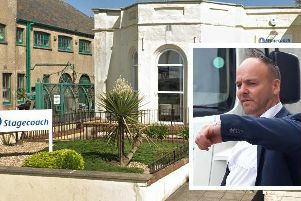 Kieoron Sheer, 32, of Franklin Road, Portslade, was fined £120 and must pay £30 victim surcharge, £85 costs, after admitting failing to provide a specimen of blood for analysis in Lancing on September 18, 2018. He was disqualified from driving for 12 months. Reece Wise, 22, of Cotswold Road, Worthing, was fined £300 and must pay £30 victim surcharge, £85 costs, after admitting drink-driving (50mg of alcohol in 100ml of breath) in Cotswold Road, Worthing, on February 6, 2019. He was disqualified from driving for 12 months. Stephen Harris, 24, of Solway Close, Littlehampton, was given a community order with New Me Strengths Programme Requirement and Rehabilitation Activity Requirement after admitting making an indecent photograph, namely 17 category C photographs / pseudo-photographs of a child between March 8, 2018, and March 17, 2018. A sexual harm prevention order was made for five years. He must pay £85 victim surcharge, £85 costs. Christopher Smith, 20, c/o Haigh Copse, Angmering, was discharged conditionally for 12 months and must pay £20 victim surcharge, £85 costs, after admitting stealing various food and drink items worth £58.70 from Asda on July 8, 2018. Karl White, 30, of Ford Road, Arundel, was fined £60 and must pay £30 victim surcharge, £85 costs, after admitting using threatening, abusive or insulting words or behaviour or disorderly behaviour with intent, causing harassment, alarm or distress in Angmering on July 8, 2018. He was discharged conditionally for 12 months after admitting stealing various food and drink items worth £58.70 from Asda on July 8, 2018. He was fined £60 after admitting damaging Christmas trees at Lower Trees Nursery, Angmering, on July 8, 2018. Edward Elsden-Smith, 22, of Offington Lane, Worthing, was fined £100 and must pay £60 costs after admitting breaching a community order by failing to attend unpaid work on January 6, 2019, and failing to attend an office appointment on January 16, 2019. Rafat Chairentinoglou, 22, of Chichester Close, Hove, was fined £160 and must pay £30 victim surcharge, £85 costs, after admitting possessing cannabis, a class B drug, in Worthing on November 20, 2018. Edward Roberts, 36, of Shelby Road, Durrington, was fined £480 and must pay £48 victim surcharge, £85 costs, after admitting drug-driving (14ug/l cocaine) on the A24 Washington on October 31, 2018. He was disqualified from driving for 16 months. He also admitting drug-driving (734mg per 100ml benzoylecgonine) on the A24 Washington on October 31, 2018, no separate penalty. Robert Aller, 60, of Burnside Crescent, Sompting, was discharged conditionally for 12 months and must pay £20 victim surcharge, £85 costs, after admitting resisting a police constable in the execution of his duty in Burnside Crescent, Sompting, on December 11, 2018. Luke Newsom, 31, of Sylvan Road, Sompting, was given a community order and must carry out 40 hours’ unpaid work after admitting harassment by sending numerous text messages in Worthing between July 1, 2018, and December 2, 2018. He was given a restraining order and must pay £85 victim surcharge, £85 costs.